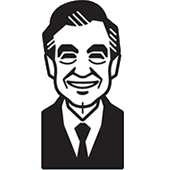 Mister Rogers has been thinking of the fire at Corney's factory and talks about firefighters. Picture Picture shows a film about firefighters preparing to battle a fire. Mr. McFeely arrives with a set of firefighter's gear on loan from the Neighborhood volunteer firefighters. Mister Rogers tries on the gear and pretends that he is rescuing a doll sitting in the window and then he sings Some Things I Don't Understand. In the Neighborhood of Make-Believe, King Friday is talking to Handyman Negri about rebuilding the factory when Sara Saturday arrives to express her concern. Corney is staying at the clock where Daniel explains to Handyman Negri that Corney is very sad and has not wanted to talk about the fire. When Handyman Negri encourages Corney by agreeing to help him rebuild the factory, Corney begins to realize that he can depend on his neighbors during times of trouble. At the factory site, Handyman Negri tries to salvage some of Corney's instruments from the remnants of the factory. Lady Elaine Fairchilde arrives and expresses concern that others will think she started the fire since she is known for her occasional mischief. Handyman Negri reassures her by singing Sometimes People Are Good. Much to Corney's delight, Lady Elaine helps Handyman Negri locate some important instruments in the rubble. Back at the house, Mister Rogers sings Sometimes People Are Good before Mr. McFeely returns to pick up the firefighter's gear. 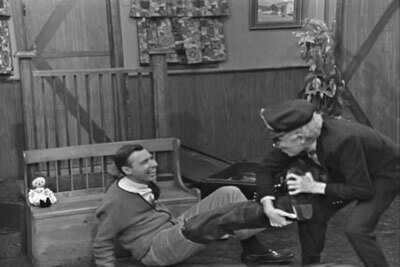 Helping Mister Rogers take off the firefighter's gear, Mr. McFeely accidentally pulls him to the floor.